I have been knitting—mystery project is taking shape (not true, its basicly shapeless, it just gettting bigger) Wanna see? There isn't much too see, and this is not the best view (intentionally) but its also 16 inches long now.. the end is approaching! I have been writing code too. With a lot of effort, you can find my blog—it's hidden in plain sight rigth now—It's still a work in progress, and not quite ready for the public yet. It's just 3 days old right now, and a good start, but still rough around the edges. Oh and look at this—Some fiber--(roving) that I KNEW I was never going to spin—was given away--it was an ounce or 2 of alpaca. I offered more fiber to another spinner—Liz--(half for me, half for her—as a payment for spinning it up) and she spun and plied it all—and returned all of it to me! So 2 skeins (about 160 yards total) of this natural white merino. See? 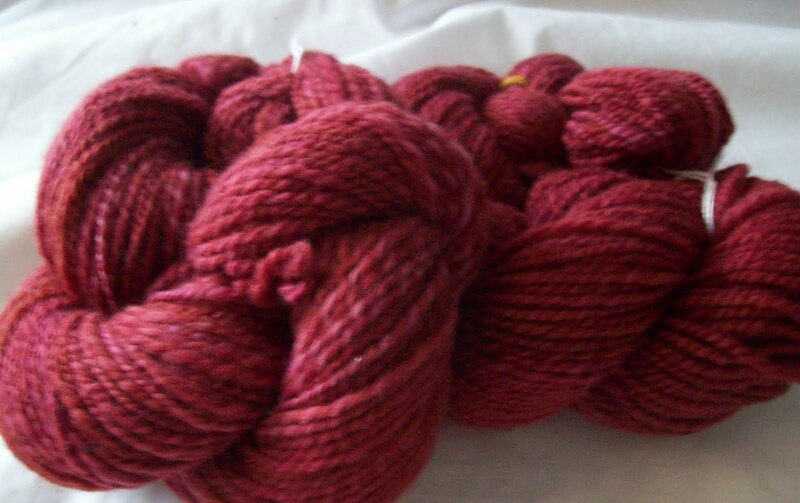 And 2 skeins (about 285 yards total) of this red—which Liz thinks is just a plain domestic wool (not a specific variety) –which is so soft and lofty! I want to make something with it RIGHT NOW. I have to finish mystery project—the deadline is closer every day!--and I am not finished yet! I have to knit up a pair of fingerless gloves for a birthdy gift (due the beginning of next week!) these are likely going to be knit on the subway this weekend. I have to get some laundry done—I need to look spiffy this weekend—I will be working at the Woolstock Yarn Shop booth in the Vogue Live market place-- (come see me, (and buy something) if you are there.) I will be wearing (natch!) some things I have knit—and matching socks, too! And I have to BLOG! Ohh! Woolstock! I worked with them at Stitches East, they're an amazing bunch :D tell them Vicky says hello! Have a wonderful time yourself as well, Vogue Live looks amaaazing. It'll be good to see you there, H. Looking forward to it.